"When the mind is pure," says an axiom attributed to Buddha, "joy follows like a shadow that never leaves." 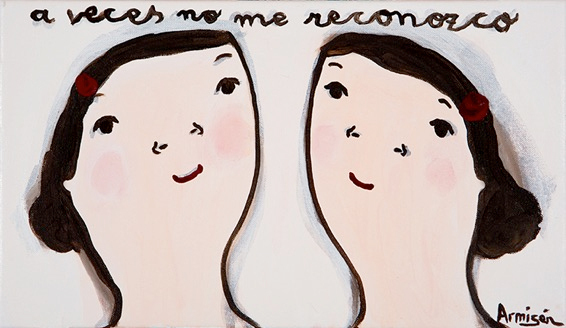 Painter Eva Armisén talks a lot about joy and the centrality of pure love to her painting practice, and she really seems to mean it. Her style is defined by a sophisticated cartoonishness, a bright but nuanced palette, and a folk-art, almost Outsider flair for reducing narrative to its most fundamental elements with more care for emotional authenticity than realism. 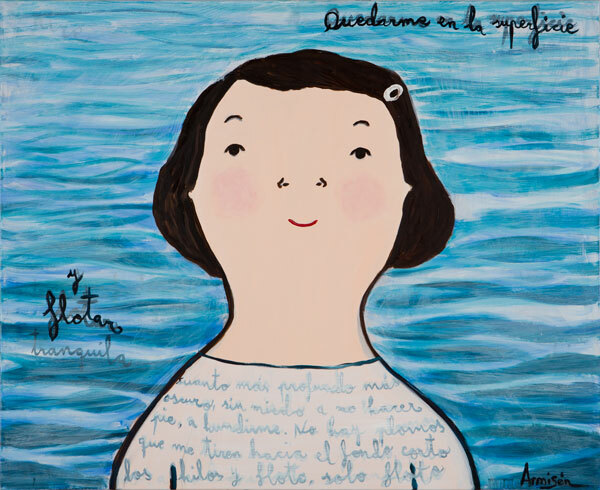 Armisén's childlike style is never to be confused with a childish one, as her relationship to the gestural language of children operates with the poise and sophistication of the 20th century European Modernists, Dadaists, and Surrealists who, like Armisén felt that a more direct, undiluted expression of human consciousness could be found in the "pure mind" of childhood than in the ateliers of academia. When today's MFA-anointed artists speak wistfully about un-learning the constraints of their educations, this is what they mean. 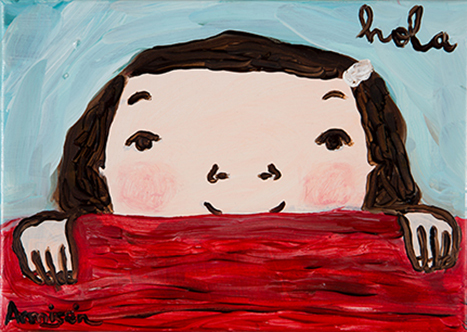 All her works feature variations of a core self-portrait, a girl with dark wavy hair, rosy cheeks, a button nose, and optimistic eyebrows. She's adorable, and she has adorable adventures. Yet the crisp restraint of her compositional impulses belies her sophistication (she went to art school), as her blocky objects, linear angles, and chromatic schemes are engineered using refined, classic techniques for breaking up space and moving or resting the eye. Like her compositional sense, her storylines are humble but also profoundly archetypal. Specific enough to tell her own memories, yet flexible enough to include anyone's, her range of symbolism is both personal and universal -- red roses, beloved pets, hearts, mirrors, handmade quilts, Sunday dresses. Her strong dark lines pop against the atmospheric nuances of her textured color fields; her reductive elements are generated with confidence and purpose such that her gestures become the figures' actions inside the picture. As in "walking," where the planar pillars of her legs hold up a tower of red dress like a work of modern architecture; the sweep of a paint brush lifts the hair trailing out behind her, speaking to her speed and purpose; a rectangle of basic black defines a pavement for her to tread. And here as in many of the works, a diffuse passage of Rothko-esque pastel-hued air surrounds her like a halo and emanates from her like an aura. In a way these ambiguous backgrounds are almost nothing, yet in another way it's where all the most soulful action of her painting resides. 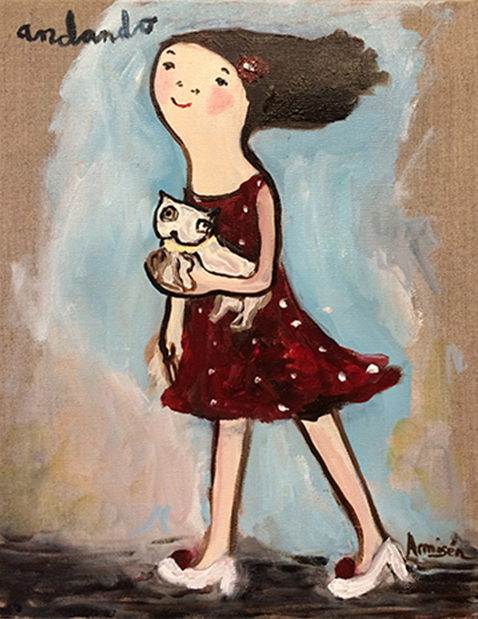 Her line drawings serve the narrative, her free paint serves the emotion below the surface. In the work "stay on the surface" the background is a rendering of water, the sea perhaps, rendered as a symphonic tapestry of shades of blue and white, green and black, forging a compelling abstraction in its own right, and filling the whole frame, no horizon, no edge or shore, effectively infinite. Jung says water is the symbol of the subconscious; it's no surprise the artist's directive is to keep it breezy. The title text continues "...and float peacefully." But yet in this image is also an acknowledgement that the rest of the mind is there, always there, and while there's no sense pretending it's not, just don't dive in too deep. That said, in works like "infinito" and "a heart of fire" her eager young face seems eager to do just that -- dive into a rose-scented fantasy of love and romance. 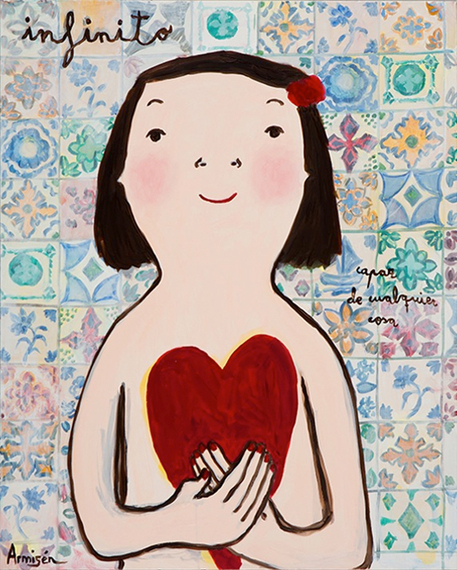 In the former she is seen naked holding a heart with a flower in her hair and the background is an elaborate setting of hand-painted tiles that reference her Spanish heritage; in the latter her eyes are closed and the room is instead a shadowy, abstract psychological setting. 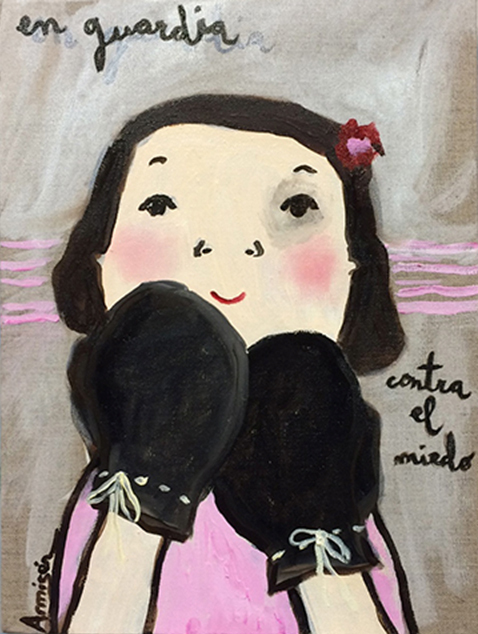 In the charming "on guard" -- meaning to guard against fear -- she dons boxing gloves and her smile and she's ready for that fight. She's still wearing them in "for love" in which as a slightly older woman she appears as the protector of a steepled pink clapboard home which is also her dress -- a tiered gown of pink wood and terracotta tiles that also form her bodice. A trellis of roads like rivers unfurl behind her as all the metaphors of the entire suite of pictures converge into her happy ending. And perhaps that's it -- the profound sincerity of a genuine happy ending -- which is her most radical gesture. Maybe it's just a fine time to fall in love. Ready, steady, go. Eva Armisen: ready, set, go is on view at CMay Gallery at the Pacific Design Center, November 12, 2015 - January 2, 2016.